The vibrating reed frequency meter has steel reed elements placed in the field of an electromagnet. The reeds vibrate in resonance with the energizing Alternating Current of this electromagnet. Only the individual reed, whose natural frequency corresponds with the frequency of the A.C. supply, will vibrate at full amplitude indicating the correct frequency on the dial. When two reeds show deflection of the same amplitude the mean of the two gives the correct frequency. 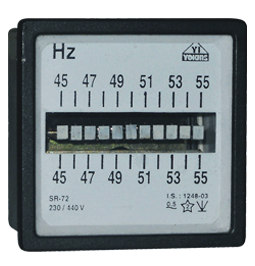 Moving Coil Meter of 90 degree or 240 degree Deflection with Fixed / Interchangeable Scale Facility.